One of my hobbies (social experiments) is photographing really trashy yards. I’ve been doing this for a number of years. I’ve recently learned there are other photographers shooting the same subject matter. Many live in Mississippi. Anyway, for some strange reason the worst looking yards tend to be in trailer parks. 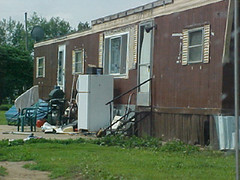 (Keep in mind I have nothing against trailer parks, mobile homes or their inhabitants. This is strictly about the yards). I Look at it this way, if you want to see lions go to Africa. If you want to see bad yards go to trailer parks. During my excursions to trailer parks searching for yards gone bad I’ve encountered numerous commonalities. These commonalities include mobile homes where toilet tanks are being used as decorative driveway markers, outdoor furniture comprised of car seats on cinder blocks, strange two-tone color schemes, indoor appliances being used outdoors to name a few. Having seen so many common elements I compiled a list and assigned a point system to allow me to score my photos. A few weeks ago I struck "gold". Almost. I spotted a nasty yard complete with a person sleeping in their recliner. The recliner was placed smack dab in the middle of the yard. Nowhere near the porch. I live for photographic moments like that. Unfortunately my sister doesn't. She happened to be driving and refused to slow down enough for me to snap a photo. Instead she sped up and gave me a lengthy speech on privacy laws. Since I'm still mad about it I'll just say my sister works at a day care. So if I want advice on the bowel movements of children or diapers I'll ask her. If I want advice on privacy laws I'll ask a lawyer. I have some pretty funny/ interesting trailer trash photos.